We offer the latest cutting edge technology for Sun and Age Spot Removal. We are only one of two Las Vegas shops with the Rev Lite Q­switch ND YAG laser. All skin types will develop some form of sun damage as we age. They do not need to be permanent. Take the first step.Call today. We charge $100 per one inch of spots. Pick 10 small ones or one large area. Whatever fits into that quarter size area. We do not believe that looking younger and feeling amazing must break the bank. Nor does it require a multi-session commitment. Come in and see for yourself. The results are truly amazing. 1) What causes Sun and Age spots? Sun and Age Spots are pigmented lesions that begin to appear as we age. If we spent a lot of time in the sun for years and years,we will be prone to more spots at a younger age.Pigmented Lesions or Sun and Age spots are a result of proglonged exposure to the Sun over many years. 2) Why do I have brownish spots on my face and hands that were never there before? After years of direct exposure to the sun the skin will begin to overproduce melanin in some areas. The result is blotchy browish spots, known as Pigmented lesions. Most people will see them on their face,chest and hands, as these are areas typically exposed to more sun than others. However you can have them anywhere on the body. 3) How does a Laser remove these spots? The laser can pinpoint the damaged cells so that we laser only the affected area. This in turn will kill only the damaged surface skin. After a week to 10 days the surface will slough off, and the healthy skin underneath will be visibly lighter after only 1 session. With each session you will see immediate visible lightening of the spot. 4) Liver and Age Spot Removal – How many treatments will I need? For most people you will achieve the desired results in 3 or 4 treatments. 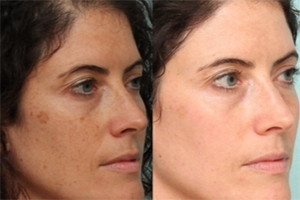 Although results will vary based on skin type and darkeness of the spot or spots. 5) Will they come back? After a year or more or if you continue to expose the areas to sunlight they may re-appear. Most people achieve permanent results. However they are easily re-lasered away. After initial removal we suggest annual treatments to keep your face glowing and radiant! Is there a difference between Sun Spots,Age Spots,Liver Spots or Freckles? They are also called solar- lentigines and pigmented lesions. They are ALL a result of UV rays. Sun and Age Spot Removal…As we age they tend to be everywhere they weren’t before. That is because as we age and the areas that are already over producing melanin(little baby spots) will tend to continue to absorb UV rays and can actually darken or increase in size as we age. Freckles….If you had them as a child they will probably darken as we age because they will continually be absorbing UV rays over our lifetime and gradually darken and or increase in size. Liver Spots…… Not quite sure where the name came from but they are the exact same thing. Pigmented lesions… So they are ALL the same thing with different names. Age spots are caused primarily by years of exposure to UV rays. Either from fun in the sun, tanning beds or outdoor summer sports. The pigment in the upper layers of skin which is the epidermis is the layer that gives us our natural skin tone is called melanin. Prolonged long term exposure to UV light will accelerate the melanin production, creating a tan to protect the under layers. Are often referred to as “age” or “sun” spots and actually have nothing to do with our Liver at all. The brown and flat spots are many times caused by years spent in the sun. The spots are larger than freclkles, are flat and often appear on the areas of the body that are most often exposed to the sun. Age spots are harmless, but if they are unwanted they can be removed. Age spots also called sun or liver spots are solar lentigines. They are typically brown or black, flat and tend to vary in shape and size. They appear anywhere but especially on the face, hands shoulders or arms. Don’t confuse them with cancerous growths. Always see a dermatologist if you are unsure. Age spots are harmless and do not require treatment. The best way to protect your skin from UV damage is to use a broad-spectrum sunblock everyday, everywhere, always. No one ever sits us down in life or school and say’s OK here is what you need to know to care for your skin, forever.If they did we wouldn’t be having this conversation. Remember the entire body when it comes to skin care. One of the biggest contributors to sundamaged skin is from overexposure to UV rays. Don’t get me wrong.. Vitamin K is essential and life happens outdoors. Using common sense and prevention we can avoid doing a lot of damage to our skin over a lifetime. Us a broad-spectrum sun block every day, all the time from head to toe.Protect your skin from sunburns. Always remember that your lips can burn as well, so always use a lip balm with sunscreen or simply apply sunscreen to your lips. Your scalp can also burn, so wear a hat.Wear long sleeves when on the beach or swimming. Reapply sunscreen all day while outside, use umbrellas at the beach and overall good sense when it comes to the sun.